By now everyone knows that Merriweather Post Pavilion will be renovated and Howard County is helping to pay for it. In this post I dive a bit more into why the renovations are necessary, exactly what is proposed to be done, and how much each set of projects will cost. I start with the three largest categories of projects, which together will cost over $10 million, or over half the total renovation budget. In his own blog post last week Tom Coale gave a good summary of how the renovations will be funded, but noted that he didn’t have access to the source documents. As it turns out, the costs and dates for the renovations are laid out in Exhibits A and B of Amendment 2 to Amendment 12 [PDF] to Council Bill 24-2014, the legislation by which the Howard County Council approved the fiscal year 2015 operating budget. (Howard County’s fiscal year 2015 begins July 1 of this year.) The proposed renovations are based on (but not identical to) the set of renovations described in the recent Merriweather Post Pavilion Physical Review Update (of which I have only a draft copy [PDF]) from Ziger/Snead (the Baltimore architectural firm hired to advise the citizens advisory panel). That document is in turn an update of the Ziger/Snead report included in the 2005 final report [PDF] of the citizens advisory panel on Merriweather Post Pavilion. The original 2005 Ziger/Snead report recommended $19.5 million of Merriweather renovations, spread across 16 budget line items and five years.1 The draft 2014 Ziger/Snead update to the report has a new figure of $24.6 million for renovations, including some new items not in the 2005 report (see “Ballpark Pricing Cost Estimate”, page 71 of the PDF). Both estimates include 30% extra for “soft costs”, presumably including project overhead and other costs not accounted for in the base estimates. Exhibit A to Amendment 2 to Amendment 12 to CB24-2014 includes 19 budget line items for a total of $19.0 million, with only 20% allocated to soft costs. The most costly renovations in Exhibit A fall into the following general categories, in decreasing order by total cost; the budget figures listed do not include soft costs. Note that the exact scope and budget of the individual categories and projects may change based on further design work, and are all subject to Planning Board approval. I have tried to match the items in Exhibit A with the items A through P in the draft 2014 report; however in some cases the correspondence is not exact or or is unclear. Interior of east restroom at Merriweather Post Pavilion. “East Restrooms remain cramped and deteriorated.” Image and original caption from the draft 2014 Ziger/Snead report, page 53 of the PDF. 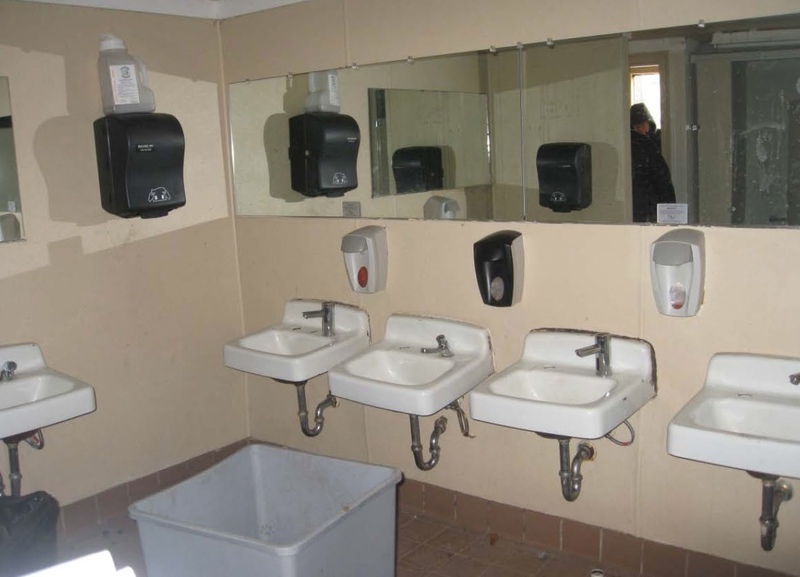 Replace or renovate existing restrooms, concession stands, and box offices. The restroom and concession stand projects comprise three equal-size Exhibit A budget line items across three years (“Restroom/Concession A”, “B”, and “C”), for a total of $3.7 million, while the box office project comprises two equal-size budget line items across two years (“Box Office 1” and “2”), for a total of $0.9 million; the total budget for this category of improvements is $4.6 million. There are currently five restroom facilities and five permanent (as opposed to seasonal) concession stands at Merriweather; in some cases a restroom and concession stand are co-located in a single building, while others are standalone. According to the draft 2014 Ziger/Snead report only one building (“Stand Two”) contains up-to-date and fully code-compliant restrooms and concession stand (pages 15-16 of the PDF). 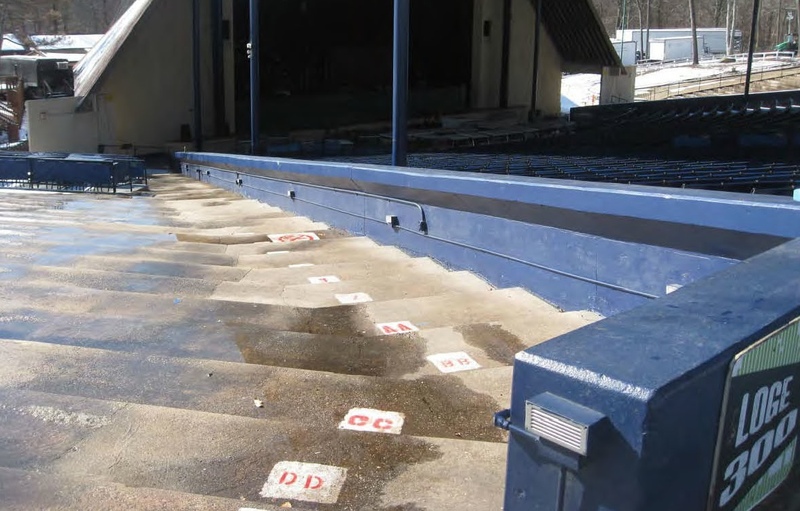 Merriweather has two box offices (“East”/“South” and “West”); per the report the East/South box office suffers from water infiltration, and neither box office is easily accessible by car (page 15 of the PDF). The draft 2014 Ziger/Snead report recommended totally replacing three of the restrooms and renovating two others that are located in historic buildings, at an estimated cost of $2.0 million (item B, pages 17, 65, and 71 of the PDF). The same report also proposed replacing and (in some cases) relocating the concession stands and box offices, at an estimated cost of $2.6 million (item H, pages 18, 67, and 71 of the PDF). The total for items B and H was $4.6 million, the same as the total of the corresponding budget line items in Exhibit A. I therefore presume that these renovations will be done pretty much as described in the draft 2014 report. Merriweather Post Pavilion loge area to the left, original seating area to the right. “Original concrete cheek wall between original and newer Loge seating obstructs ingress/egress.” Image and original caption from the draft 2014 Ziger/Snead report, page 36 of the PDF. Merriweather Post Pavilion from northeast, showing main roof and seating area and west loge area beyond. Image from the draft 2014 Ziger/Snead report, page 32 of the PDF. 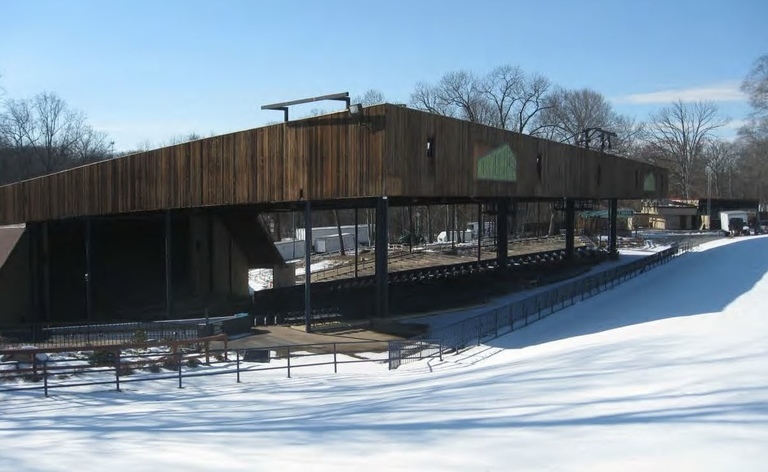 The second project, to raise the main pavilion roof, was not included in the 2005 and 2014 Ziger/Snead reports, but was apparently part of a set of renovations proposed by IMP Productions, the operator for Merriweather Post Pavilion. 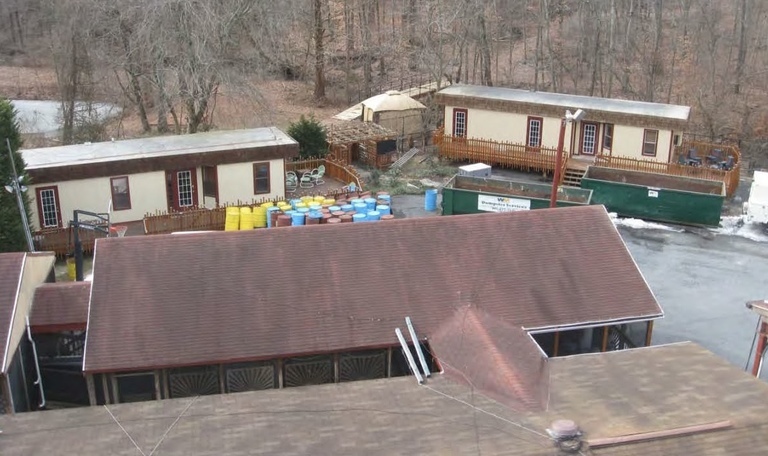 The 2005 and 2014 reports recommended restoring the main roof, including replacing the roof surface and the vertical boards on the sides of the roof, at an estimated cost of approximately $440,000 (item M, pages 20, 68, and 71 of the PDF of the 2014 draft report). The idea of raising the main roof was suggested by IMP as a way to “improve sightlines from the Lawn and accommodate installation of V.I.P box seating and green roof lawn seating at the level of permanent roofs over the side Loges” (page 5 of the PDF).3 Whether it’s raised or not, the main roof still requires renovation, so this would presumably part of the project in any case. Merriweather catering area (foreground) and dressing trailers (background). Image from the draft 2014 Ziger/Snead report, page 42 of the PDF. Replace the existing performer dressing rooms and catering areas. This category comprises one Exhibit A budget line item (“Dressing Room / Catering and New Stage”) budgeted at $2.7 million. Currently performer dressing rooms are housed in various temporary trailers scattered behind the pavilion. Per the draft 2014 Ziger/Snead report these are difficult to maintain (pages 14-15 of the PDF). There are also two catering decks, “essentially screened-in porches” that need to be brought into full compliance with relevant codes (page 15 of the PDF). The draft 2014 Ziger/Snead report recommended constructing a new two-story 15,000-sf building to house performer dressing rooms, catering areas, and various other backstage functions, at an estimated cost of $4.0 million (item G, pages 19, 66-67, and 71 of the PDF). Since the budgeted amount of $2.7 million is significantly less than this I presume that the plans for this category of renovations have been scaled back from what is described in the draft 2014 report. In this regard note that the line item in Exhibit A also references a “New Stage”, something not included in the corresponding item G in the draft 2014 report, which would further reduce the amount to be spent on backstage improvements. In the next post I’ll discuss the remaining categories of renovation projects and their costs.